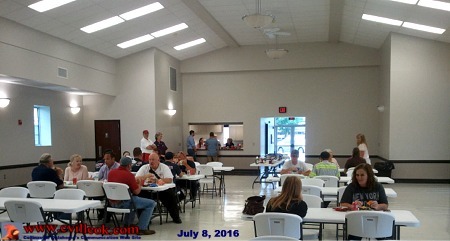 The Collinsville Chamber of Commerce hosted their annual appreciation lunch for Collinsville City (and county) employees at the newly refurbished Veterans Building Friday July 8th. 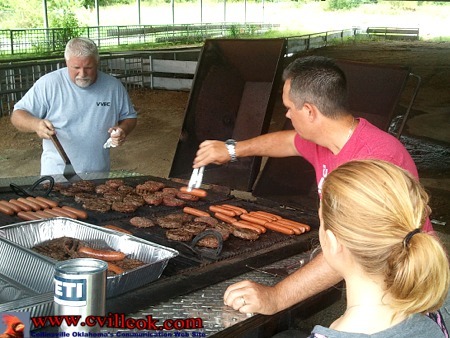 There were plenty of burgers and hot dogs served up by the Chamber from a portable grill near the fairgrounds July 8th. 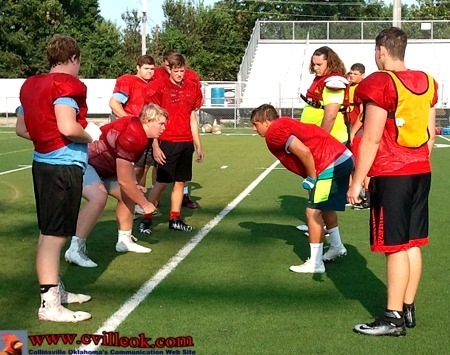 The HS Football Cardinals were on Sallee Field for some summer time workouts and instructions at a mini-camp this past week.. In 2015, boating accidents accounted for approximately $42 million in property damage, according to the American Boating Association and the U.S. Coast Guard. As Oklahomans hit the lake to escape the summer heat, Oklahoma Farm Bureau and Affiliated Companies is offering tips to ensure smooth sailing when it comes to watercraft insurance coverage. If you would like to speak with an Oklahoma Farm Bureau representative, please let me know. OKLAHOMA CITY  In 2015, boating accidents accounted for approximately $42 million in property damage, according to the American Boating Association and the U.S. Coast Guard. As Oklahomans hit the lake to escape the summer heat, Oklahoma Farm Bureau and Affiliated Companies is offering tips to ensure smooth sailing when it comes to watercraft insurance coverage. Get coverage in and out of the water. Unless your boat is permanently stationed in a marina, you will need to transfer your watercraft to the lake on a trailer. Not all insurance policies cover traveling with your watercraft. Do your research, and look for a policy that will keep you covered while your boat is in the water, docked or on a trailer. New watercraft means new coverage. When you purchase a new boat or watercraft, your insurance needs change. Even if you had a boat prior to this purchase, you need to look at your policy and make any updates you need to ensure your new watercraft is fully covered. This includes protection against the risks of owning and operating your watercraft. Your new policy should include coverage for your property, protection for injury or damage to others and medical payments coverage. Size influences coverage. Not all watercrafts are the same when it comes to insurance considerations. The size of the boat or watercraft indicates how many people can be on or in the craft at a time and could play a factor in what policy you may need. Motor boats, sailboats, jet skis and fishing boats are all different types of watercrafts and can differ in policy needs. Talk with your agent to find the policy that best fits your needs and the needs of your recreational vehicle. Utilize your agent. Talking with your agent before you purchase a new watercraft can help you understand what type of policy you will need based on your purchase. Your agent is there to help answer any questions you may have and will help find the right policy for you. Founded in 1942, Oklahoma Farm Bureau is a grassroots organization of farm and ranch families united for the purpose of analyzing issues and formulating action to achieve educational improvement, economic opportunity and social advancement in each of Oklahomas 77 counties. As the state's largest general farm organization, OFB is committed to improving the lives of rural Oklahomans through advocacy, education and member benefits. To learn more, visit http://www.okfarmbureau.org/. OFB as such, has never rendered business services directly, or carried on any commercial activities since its conception. All of the business services that are made available to members are done so through affiliated companies, or agreements with third party companies or organizations, such as Oklahoma Farm Bureau Mutual Insurance Company (OFBMIC). Therefore, in order to write and maintain insurance with OFBMIC and/or one of its brokerage carriers a Membership must be purchased with OFB. OFBMIC serves Oklahomans in all 77 counties insuring various risks they face every day, and because each agent lives and works in Oklahoma, they are present when needed most. To learn more, visit http://www.okfarminsurance.com.